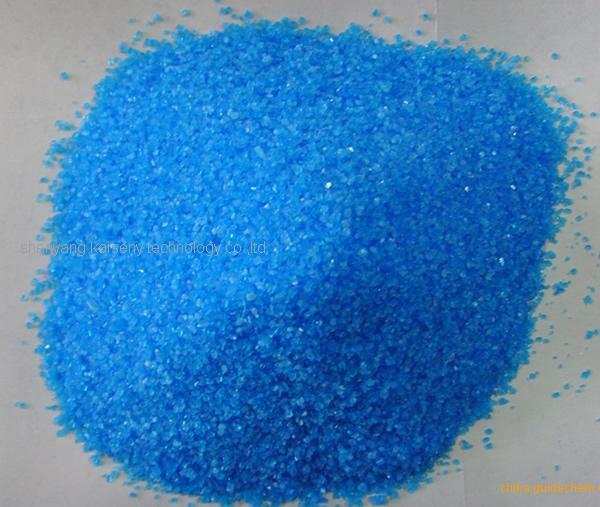 Description: A blue crystalline solid used in electroplating and as a fungicide. Purposes: Copper sulfate pentahydrate is a fungicide. However, some fungi are capable of adapting to elevated levels of copper ions. Its compound with lime, called Bordeaux mixture, is used to control fungus on grapes, melons, and other berries. Another application is Chechen compound, a mixture of copper sulfate and ammonium carbonate used in horticulture to prevent damping off in seedlings. Medical Purposes: Copper sulfate was used in the past as an emetic. It is now considered too toxic for this use. It is still listed as an antidote in the World Health Organization’s Anatomical Therapeutic Chemical Classification System.